In addition to breakthrough code reading, there are DataMan® products for every step of the direct part marking (DPM) process, including quality verification, and data validation. Easy-to-use and reliable DataMan products enable quality control solutions for applications that require the highest read rates for 2D Data Matrix codes—critical to product traceability. Compliance… All units include contract compliant verification to the AIM DPM Quality Guideline as required for U.S. Department of Defense (Mil Standard 130) and the AIAG (Automotive Industry Action Group) B-17 Guideline. Fully integrated design… All systems include easy to use software, integrated lighting and optics. Certified calibration… DataMan verifiers includes a certified calibration target for establishing AIM DPM reflectance values. Reliable and consistent… DataMan verifiers are easy to set up, use and provide reliable, repeatable results. DataMan brings a “first” to industry... portability. This enables manufacturers to perform verification on the factory floor, rather than at a remote or fixed verification station. The combination of compliance and portability provides users with advantages that set DataMan 7500 series verifier apart from all others. The DataMan 7500V incorporates 30 degree dark field lighting and is ideal for verifying nameplates and other flat parts. 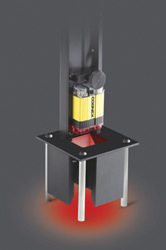 Mechanical standoff ensures uniform illumination and a fixed working distance. The Cognex DataMan 100V verifier allows users to quickly measure code quality to all current industry quality standards. Integrated design provides users with an easy-to-use verification solution for reliable and repeatable results. Contract Compliant lighting option available with the stand and integrated bright field and dark field lighting (as shown). This advanced lighting design with both 30 degree and 90 degree angle lighting allows the DataMan 100V to grade the widest range of mark types and surfaces including mirrored surfaces. Verification to all industry standards including AIM DPM Guidelines, ISO15415 and AS9132. To simplify and speed up the system integration process, Cognex offers a wide range of optional accessories designed specifically for use with handheld DataMan 7500 Series Verifiers and the fixed-mount DataMan 100 Series Verifiers. The calibration card establishes a reference for part surface reflection values as well as reference for actual printed cell size of 2D codes. The card is NIST SRM-1930-90 Certified. The standoff is inserted into the light pipe to provide optimized working distance for lighting during verification applications. It can also be used to provide consistent reading distance in non-verification applications.